Are you dealing with research data? Do you want to learn more about research data management, discover new resources and connect with others who care for data? If so, then the 23 Things: Libraries for Research Data may be perfect for you! Courses in research data management can be hard to find, expensive or part of a larger degree program. 23 Things: Libraries for Research Data – developed by the RDA’s Libraries for Research Data Interest Group - is an online, free, flexible, self-paced learning program (about resources and tools) for librarians (including Library Managers, Data Custodians) that want to incorporate research data into their practice of librarianship. 23 Things is also for all those who create data (Researchers, Early Career Researchers, Research Assistants) and those who are looking to incorporate data into their future careers (PhD students, Librarianship and Information management students). 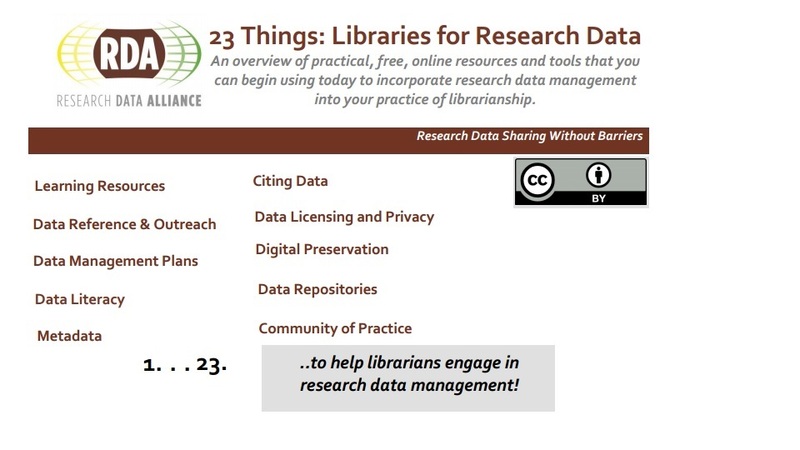 The 23 Things online resource (in 11 languages) is presented as a two-page handout that groups 23 free, online resources to help librarians get involved in research data management into 10 categories. These latter are presented in a way that allows users progressively build their understanding of key concepts and gain experience in research data management. The RDA program inspired the development of an Australian version called ‘23 (research data) Things’ that expands on the RDA model by introducing three different levels of activity for each ‘Thing’ and a robust community support. The 23-week program was paced (concluded in early October 2016) for participants to undertake one Thing per week and to complete all 23 Things over several months. Over 1,500 people participating in the program from countries around the world shared questions, ideas and learnings with others involved in the program through a dedicated online discussion forum, local community groups, webinars and social media. ANDS has also developed a re-purposed toolkit to encourage you to take the 23 Things and adapt it for your situation, adopt it as suggested training for all staff, contextualize it for your discipline, or extend or contract it to meet your specific research data knowledge needs. One example of an adaptation of the 23 Things is a creation of the top 10 research data Things for Medical and Health. Writing and implementing DMPs - Who should do what? What help is needed?